In those precious weeks before a woman even realizes she's pregnant, an embryo will have already developed a neural tube, a hollow structure made of cells which will eventually become the brain and spinal cord. 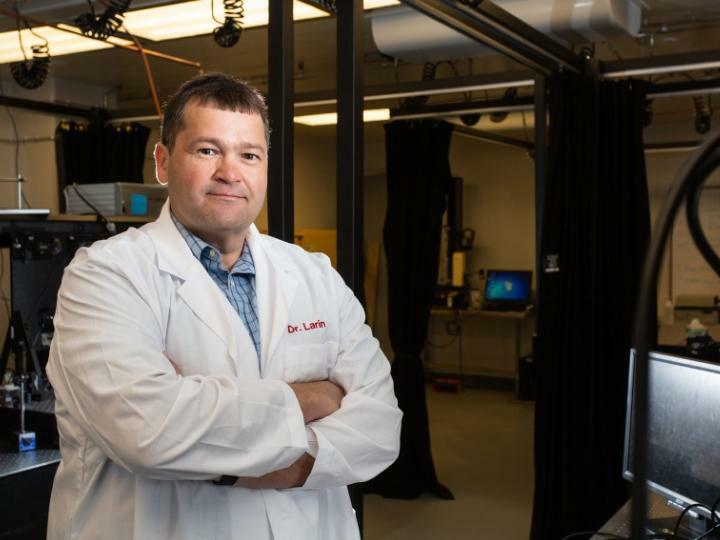 Now, with $3.2 million from the National Institutes of Health, UH professor of biomedical engineering Kirill Larin will tackle the evolutionary anomaly of why the neural tube closes in most embryos but remains open in others, leading to birth defects such as spina bifida and anencephaly. Neural Tube Defects (NTD) are the second most common structural birth defect in humans, affecting upwards of 500,000 pregnancies worldwide and approximately 2,400 pregnancies each year in the United States. Together with Baylor College of Medicine professor Richard H. Finnell and Giuliano Scarcelli, assistant professor of bioengineering at University of Maryland, Larin will create new technology combining Brillouin spectroscopy and optical coherence tomography (OCT) to deliver 3D images of the mechanical factors at play when the neural tube closes and – in so many cases – when it does not. Most commonly used to examine the retina, high-resolution OCT is an imaging technology that uses light waves to take cross-section pictures. Brillouin spectroscopy is a light scattering technology that will sense the stiffness of the tissue, which is critical to its success in closing. During malfunctions there are areas of low stiffness, so it is not folding together properly, Larin said. "We will create this hybrid microscope putting these two powerful technologies together. OCT will image the development of the neural tube while at the same time, Brillouin spectroscopy will probe its mechanical properties. We will be imaging and sensing at the same time," said Larin. Finding out how mechanical properties controlling neural tube closure in developing embryos can be manipulated to ensure proper neural development is the first step to exploring treatment for the defect. "If we find out what causes the tube to close, what is exactly happening, we can develop new drug treatments for at-risk embryos," said Larin. The work fills a significant data gap in understanding neural tube closure biomechanics. "It's still one of the great mysteries of life, no one on earth knows how this happens and that is really exciting to us," said Larin, "because we will be the ones to find out."